Detailed Elephant Tank model at 1/72 scale from behind. Here we show a compiled set of 1/72 scale model for the famous German Elephant Tank and Ferdinand Tank. Note that some models are die-cast so they are already built and painted. But others are plastic models and require to be built and hand-made painted. Ferdinand Tanks column in Eastern Front 1944. 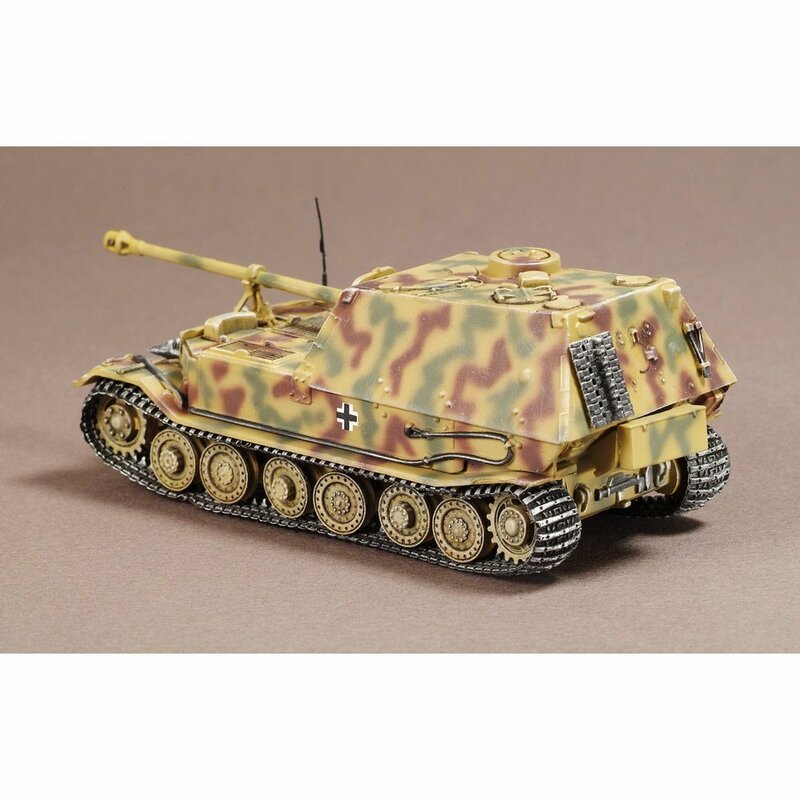 1:72 Scale Metal Diecast – SD.KFZ 184 Panzerjager Elefant Tank – Length: 4.25″ (from end of vehicle to tip of the main gun) Width: 2” This Elefant tank model’s body is made of metal while the turret is made of plastic. The tracks are made of rubber and are fitted, however they do not move. The coloring and markings are accurate and realistic. The maker of the model,War Master, really did a good job with the model, the panel lines and details are very clear and crisp. These models have different details engraved such as doors, hatches, panels, lights, ports, antennas, machine guns, ropes, shovels, etc; all of these done with high accuracy and proportion. When they are painted in different color, say for example, shovels and ropes, they are indeed painted accurately. The weathering effect that these tanks have, such as smoke and oil staining makes them look very realistic. Depending on the particular type of tank, some will have machine guns and antennas that look very accurate These models come in really nice packaging. The model itself is attached (via screws) to a plastic base which is made to look as rough terrain. The base measures about 7 inches by 3 and at one side of the base is some info about the model such as the type of tank, the outfit it belongs and the time period it served. Moreover, the whole base can be topped with a transparent acrylic top which encases the whole tank in a rectangle that measures roughly 7 inches by 3 inches by 3 inches high. Lastly, each model comes in a window box and included in the box is a piece of cardboard which serves as certificate that states the Limited Edition nature of the model along with the numbering (out of 2000 copies). These models are not toys, they will not last long if played with. The tracks don’t move and the turrets and their main guns and machine guns can be quite fragile because of their size. Some of the tanks will have a turret that does not rotate at all. 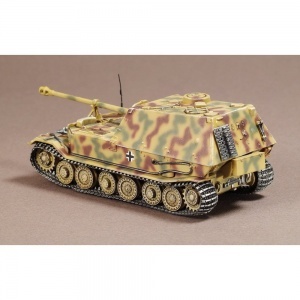 1:72 Scale Metal Diecast – SD.KFZ 184 Panzerjager Elefant Tank – Length: 4.25″ (from end of vehicle to tip of the main gun) Width: 2” This Elefant tank model’s body is made of metal while the turret is made of plastic. The tracks are made of rubber and are fitted, however they do not move. The coloring and markings are accurate and realistic. The maker of the model, Altaya (a division of DeAgostini), really did a good job with the model, the panel lines and details are very clear and crisp. These models have different details engraved such as doors, hatches, panels, lights, ports, antennas, machine guns, ropes, shovels, etc; all of these done with high accuracy and proportion. When they are painted in different color, say for example, shovels and ropes, they are indeed painted accurately. Depending on the particular type of tank, some will have machine guns and antennas that look very accurate. The model itself is attached (via screws) to a plastic base which is made to look as rough terrain. The base measures about 7 inches by 3 and at one side of the base is some info about the model such as the type of tank, the outfit it belongs and the time period it served. Moreover, the whole base can be topped with a transparent acrylic top which encases the whole tank in a rectangle that measures roughly 7 inches by 3 inches by 3 inches high. Lastly, each model comes in a very basic disposable blister pack. These models are not toys, they will not last long if played with. The tracks don’t move and the turrets and their main guns and machine guns can be quite fragile because of their size. Some of the tanks will have a turret that does not rotate at all. (so if you try to rotate the turret or change the elevation of the gun and feel some resistant, better leave it alone and don’t risk breaking something). The “Ferdinand-Elefant” assault tank was derived directly from the prototype of the VK 4501(P) heavy tank, which was outperformed in the rivalry for a new type of heavy tank for the German army. The winner of the contest was the VK 4501(H) prototype, which later became the “Tiger” Sd.Kfz.181 heavy tank, undoubtedly the best-known German tank. sPzJgAbt 654, Eastern Front 1943 w/Zimmerit coating. The Ferdinand was a heavy assault tank designed by Porsche and built by Nibelungenwerke, especially for the needs of the Eastern Front. Ferdinand’s design was based on Porsche’s Tiger – VK 4501(P) prototype which proved to be prone to mechanical failures and was rejected in favor of Henschel’s prototype.